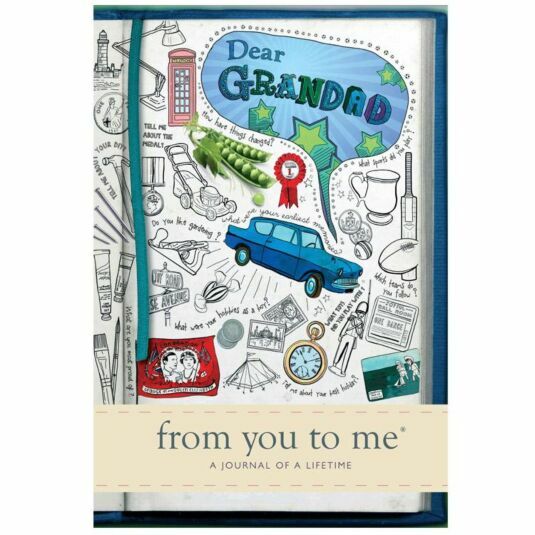 A truly wonderful gift book to help you discover all about your Grandad. Like From You To Me? Click here to view the entire range. Have you ever wondered what your grandfather was like as a child? What was it like to be young all those years ago... and what are the biggest changes he has seen in his lifetime? Are you intrigued about what he enjoyed doing when he was younger, or perhaps how he met your grandmother? Are you interested in discovering fascinating facts about your ancestors? What about YOU, and your relationship with your grandfather?. What are his memories of the times he has spent with you? What does he most like about you, and is there any advice he would really like to offer? We rarely talk about these things with our loved ones, and yet these are questions that lead to precious answers, answers that one day will be lost forever. This journal gives your grandfather the opportunity to find that book within him. And give you a story that you will treasure and pass down through the generations. Tell me about the time and place you were born? What are you earliest memories? Tell me some stories about your parents? Tell me what you can remember about your grandparents? What do you remember about the places you lived when you were a child? What do you remember about your holidays when you were young? What did you study at school, and what was your favourite subject? Describe some of your favourite memories of times we have spent together? What advice would you most like to give me? This is a truly wonderful gift which when completed and returned to you will contain priceless information that you will treasure not just for the rest of your life, but which succeeding generations will treasure as well. Founded in 2007, from you to me began life under difficult circumstances. Neil Coxon was caring for his terminally ill father, and it occurred to him that there was far more about his dad’s life that was yet been told. Neil came up with from you to me, an ingenious means of discovering more about your friends and the ones you love. ‘Dear Mum’ was the first product, encouraging the recipient to respond to questions you’d never thought to ask and stories that, until now, never got the chance to be told. It is an important process for both the person who gives the journal as well as the one who receives it: writing can be a cathartic experience for the person writing about their life, just as learning all about a relative is vital for anyone who fears stories and information are all too easily lost in this modern age. ‘Dear Mum’ was a massive success, prompting Neil, together with Helen Stephens, to expand the range to over 20 titles, ensuring no relative is excluded. Out of Neil’s tough experience, this brilliant and life-affirming gift was born, ensuring nothing important need ever go unsaid again.